Ahhhh.... it's a bright and airy home office. Lovely! What is that on the ground next to the chair? When I first looked at it, it looked like a roll of caution tape ... which made me think "why did they need a roll of caution tape"
A lot of the pictures on your site make me think "why, oh, why!!" With its boardwalk feel outside, this listing is true to "hardwood floors throughout." Honestly, do these people even look through the viewfinder when they take photos? Or do they just wander aimlessly through the property, clicking their cameraphones randomly while sipping Absolut through a straw? It's just an office chair. Could have been worse; it could have been a toilet sitting out there on the porch. Is this guy related to the lawn chair? i'm sure everyone wishes this was their office. 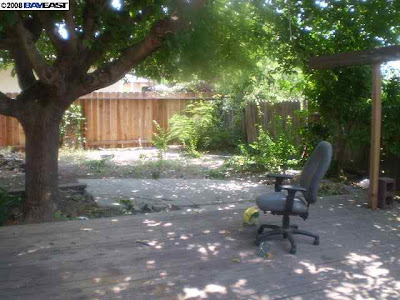 Except for the chair, this looks like Mr. Miyagi's back yard. Any minute now Ralph Macchio is going to crawl past sanding the deck with those two hand strappy things. Yeah, that would make a great office. Until it rained or snowed. And then if I were that office chair, I'd want back in the house.